Ferrari Driver Kimi Raikkonen won the Formula One Drivers Championship title in 2007. He won six races that season. Kimi Matias Raikkonen was born on October 17th, 1979 in Espoo, Finland. He started national and international kart racing from the age of ten, before taking up car racing in 1999. In 2000, the young Finn competed in the British Renault Championship, taking the title with relative ease after securing seven wins out of the ten races contested. He then made his Formula One debut for a Swiss based Formula One team in 2001, after only competing in 23 car races, none of which involved F3 or F3000. However the FIA granted him the necessary Super Licence because of the promising performances the young Finn had in earlier testing. His debut season produced some superb performances and he helped the team to their highest ever finish, fourth place overall in the constructors battle. During the next season, he was chosen by McLaren to take the place of double world champion, Mika Hakkinen, who opted to retire. The young Finn put in some superb performances throughout 2002, out qualifying his more experienced teammate David Coulthard on several occasions. Kimi Raikkonen confirmed his potential in 2003. The Finn won his first Grand Prix in Malaysia and fought for the championship title until the very last race against Michael Schumacher. 2004 promised a great deal for the Finn, but sadly it was a season of mixed fortunes. 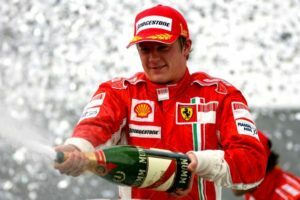 In 2005, Kimi scored seven race wins and finished second in the Championship conceding the title to Fernando Alonso of Renault team. Raikkonen won his first ever world title in 2007 with Ferrari beating Alonso and Hamilton.